Hey, remember our SOLO and all its perks and faults? It was a revolutionary idea back in 2012…. As many of you already know, early drones used to work with 3 frequencies, one for video (analog), another one for telemetry and a third one for the remote control. But now, with the “SOLO LINK” inside 3DR Solo we are able to use JUST ONE frequency for everything, making it a faster and better way to work, and opens the door for other possibilities, including a “wider pipe”, adding the possibility of -on screen display- for free and image processing, this including the advantage of HD video in real time. Let me tell you a little about the story behind SOLO LINK, and my journey here. The first time I proposed the idea of merging these 3 frequencies into 1, hand in hand with many other improvements, was back in Q4-2012 with the 3DR team. I was basically ignored. Some people in charge of making these engineering decisions were not sure it was going to work, or thought it was not a viable Project (Despite seeing the Parrot 1 flying around). I was having a really challenging moment, I didn’t have an engineering team to support me in my ideas and projects, because my team in San Diego was busy working in other stuff not lead by myself. Of course I wasn’t going to stop there, so after several talks and negotiations with my partner (thanks btw), and explaining how it was crucial that I needed a team to keep on working and developing our ideas, we agreed on setting up an independent team within the company called 3DRx, it was mostly dedicated for “skunkworks” projects, with a tight budget. Eventually, I was able to make some interviews to hire an engineer to start my new team. Over many of these, there was one person to stand out among all of the others, his name is Allan Matthews, (One of the best internal engineers At 3DR, the best ever in my opinion), he had all the qualifications I needed and I knew he was perfect for the job. Though a non engenineer inside the company who had to interview and validate him before hiring, insisted Allan wasn’t qualified…. Pppffftttt,… After several conversations and attempts to go through with this hiring process, they finally agreed with me and I could continue on to the next step of this project. As soon as he was part of my team, we started working together on this, we quickly started investigating new technologies, one that looked interesting was named GALILEO from ATMEL, but due to documentation issues and support, it wasn´t working great for us, and Allan suggested we use another platform called i.MX6 from “Freescale” now “NXP”, now “Qualcomm” which is an ARM based microcontroller capable of running a Linux OS, and the best part is it was open source and had a lot of support, which goes along with the , or at least my, 3DR vision at that time. After working a lot, creating some prototypes and running a few tests in only 3 months, we uploaded a video about our progress to YouTube, it was around May 2014 and we started to get a lot of internal attention for one simple reason…IT ACTUALLY WORKED. I’m being truly honest here, pretty deep inside of me, without trying to sound cocky or mean, proving wrong all the neigh sayers, was just the cherry on top. Still, my greatest satisfaction was for it to work, for the sake of engineering, which is what we are all about. Now with mRo, I don’t have to worry about all those issues. We had gotten to the stage where we needed to improve our hardware, because, well, it was pretty much a big ball of wires…looked raw. This is when the amazing Robert Feranec comes into our lives. A hardware designer for I.MX6, and one of the best PCB designers worldwide. He is completely dedicated to the art of PCB design and teaching it. I can say I was lucky enough to be able to talk to him and have his support on the creation of the much-needed hardware. He was kind enough to fly from Slovakia to San Diego to help us develop, just for the sake of engineering, and in record (2 weeks) time we were able to design from start to finish a completely new i.MX6 board, something that usually takes several months to develop. And an even more amazing fact is that it worked on the first assembled prototype, proving once again that Robert is a hell of a GENIUS. For sure, one of the best in the world. By the way, it’s great to know he moved to California. Taking under consideration the complexity of the technology, an eleven layer PCB, DDR3 RAM Memory, he had the skills to help us make it work, giving way to the first “Solo LINK”, which I had named at first “HD.T.C.” (High Definition, Telemetry and Controller). Once everyone started realizing how well it really worked, I was told that we suddenly needed it ASAP for the new drone. Even after I told them it was still a prototype, a working one, but an alpha prototype nonetheless, they decided to go through with it, and that is how it was installed inside SOLO. I would like to emphasize how extremely important Allan and Robert are for SOLO, and us. I am grateful and honored to have been given the opportunity to work side by side with 2 super talented geniuses and with a hell of a lot of experience on their hands. No joke. As we all know, this technology still has a lot of limitations, mainly because it works through an optimized long-range WIFI. We decided to use a PCI express, with the purpose of allowing people to easily hack it and add a better version of it like MIMO, upgrade to 4G, and probably in the future, create something with a more capable transmission scheme like our powerful relative DJI. I deeply admire the genius (another one) behind DJI, I’m glad that a few years later after I conceived the idea, they brought out their version of Solo LINK. It was a good sign. Summarizing, Solo Link is by far the most complex, yet the cheapest part of Solo, as well as the fastest on being developed, and it was a key component for positioned this drone in a slightly competitive market. It still has some flaws. It had nothing to do with the GPS but, which, for those who don’t know yet, I recently developed a new and better version of the GPS for Solo, where you may notice that the acquisition is stronger and has well design antenna coupling. You can get it now, visit us at our webpage here.Thanks for the good reviews! Please don´t forget to visit us, leave your comments or ask anything you would like to know. We are here to help and surprise our clients with new technology. This entry was tagged 3DR, allanmathews, california, drones, GPS, Jordi, mayanrobotics, mRo, mRobotics, PCB, robertfarnell, solo, sololink, startup. Bookmark the permalink. Awesome, thanks for the write-up on how the Solo LINK was designed, it’s definitely fascinating. I am interested in extremely long range telemetry and command and control for rovers (boats specifically) so anything you can do with 4G or even using the Iridium Satellite network is high on my list. Getting everything compressed into one signal is huge though, congrats and I hope to see more products from you guys! btw: when will you have the B.robot available? The b-bot is now manufactured in California, so we are still “adjusting” the factory and the quality. We are aiming to release a small batch next week, if everything goes accordingly to the plan. Great to see this, your write up is excellent! Will you carry Lidar or vision systems, Check out http://coloradoengineering.com/standard-products/tx1-som-carrier/ they also make a super gpu autopilot. I miss working you. Great times in the beginning! Great to hear that your are working on an open source H.D.T.C as I don’t see any options to build a drone (other than using DJI autopilots) that consolidates the control, telemetry and video into one radio solution. Do you have further information on this project ?. Very interesting post Jordi. I am definitely looking forward to you producing a HDTC system that we can use on other custom drones. DJI is kicking our butts in this area, so it will be great to catch up. Allan is a very talented guy to work with. I’m glad I had a chance to work with him and test all the sw loading onto the i.MX6. Allan was able to make the software upgrade process quick and easy for the Solo. Jordi thank you so much for sharing this story, I enjoyed getting to know the developments behind Solo and Sololink. It’s funny because I had the same idea with unifying all channels (probably many people had it) but I’m glad you had the skills, resources and motivation to make it work. I am looking forward to seeing what you have in mind for the next generation and hope it can compete with DJI’s Occusying, Lightbridge, etc. these are amazing. Great writeup and history of what happened at 3dr. I just found about this from seeing all the 3dr solos on sales at various locations. I am looking forward to the HDTC system for use in my hobby setup to finally have an all in one solution. I used to have a really janky setup with a separate telemetry/video/rc radio setup so this will be a huge improvement! Are you looking into having a board that supports collision detection using ultrasonic/range finder solutions? I am not sure what the Mavic uses but I think that is a killer feature, and one that will become more common place in most autonomous quads. 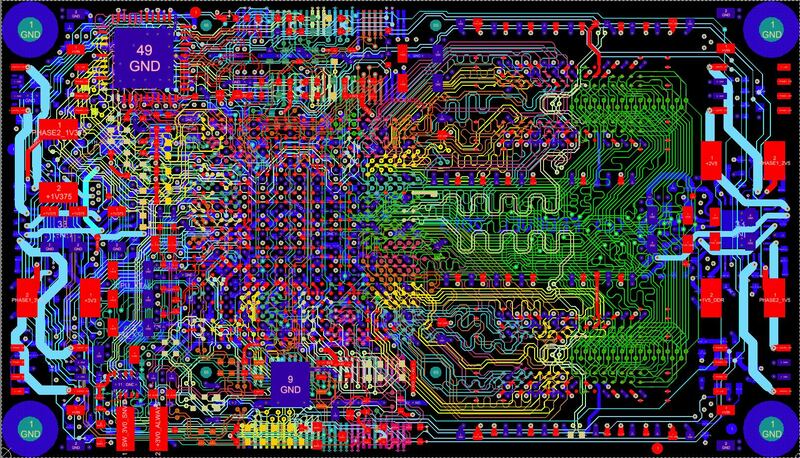 Just one note, PCB designer name is Robert Feranec, not Farnell. Farnell is electronic components supplier from UK :-). But great reading and works! Oops!!! honest mistake!!! thanks! duly noted and corrected my friend! Could you elaborate on HD.T.C? I am interested in knowing the principle itself (what does it imply to merge all three on the same frequency, in terms of engineering? ), and also the innovation in the Solo Link. More specifically, you write “despite seeing the Parrot 1 flying around” as if Parrot had done it before, but then you write “I’m glad that a few years later after I conceived the idea, [DJI] brought out their version of Solo LINK. It was a good sign.”, clearly stating that you have conceived it. I see that my comment is still awaiting moderation, when another one was accepter two days later. It was definitely not offensive! I loved the Solo, and I am a big fan of your work =). I just want to understand a bit more the difference with Parrot’s and DJI’s system! I would also like to know if one can easily make a HD.T.C system as a hobbyist (I’m not sure if this is open source). Hello Jones, usually all comments that require some information, such as this one, takes a little longer for me to be able to respond, I do apologize for that inconvenient. It was never considered offensive, we actually encourage everyone to ask anything on their minds and of course our mRo team will try to be of help with everyone. Then, there is SOLO that uses a much improved version of WIFI. and DJI uses a similiar signal encoding as HD.T.V. broadcast. Referring to the part where I wrote “I’m glad that a few years later I concieved the idea…” I was simply stating that I felt I was in the right track on innovation with my ideas, since I was not the only one to think of it. I admire all the work they have done and continue to do … giving us the difference on the time being.. They had the resources and the support to get it done, whereas I was struggling to make it happen. Can’t wait to see this happen – let us know if you need some beta testers. Hi Jordi – Question: Is & will 3DR continue to make the Solo. I love mine but am a little tentative to buy some of your products if I cant relay on replacement parts from 3dr going forward. Thanks and the products you are providing look great. Is there actual product one can put in drone and start pioneering? If I might as, which PCIe card was used in this product? Hi, Let me pretty much cancel my last comment and ask another instead. The first section of the article says “early drones used to work with 3 frequencies, one for video (analog), another one for telemetry and a third one for the remote control”. I imagine that says that your solo link uses one wifi signal for video, telemetry and control by using a single WiFi transceiver in the PCIe card. My question is: I expect that the difficulty in the design for this, which was, I am guessing, entirely a firmware issue, was to “multiplex” all digital signals to the PCIe card with some sort of “conditional acces” (IP address?) such that each signal could be acknowledged by the proper device outside the drone. That would probably involve “buffering” issues between all three signals. I’m also guessing that the digital video signal is some video format other than HDMI (like h.264, etc) due to bandwidth restrictions. That would leave the PCIe module unmodified. Am I close on any of these points? It’s great to see how you guys have come along. Thanks for sharing this amazing story. I wish you success in your new venture. Please contact me if you what to talk about connecting with premier innovation centers in Mexico in the field of robotics and digital communications. You may be surprised about the quality of their research. As cheap as 3DR solo bundles are now just buy one for parts. Picked up a solo extra batt gimbal and props for 300 bucks Sat. I was going to buy one then was spooked by the rumors. Bought a typhoon instead. Not a good choice. Especially after setting up the solo and flying it in really gusty winds. It was remarkably stable. More stable than the typhoon. Ordered the new gps and shield for it. That should make it even better. Only knock I have with it is the legs are too short. Great stuff Jordi et al. Hope that you’ll keep your focus on drone components and research & development. There are lots of problems out that drones are the answer to if we are clever enough to find the path. Best regards. Not sure why my post is showing my address and not my post. Could it be removed please? Great article, I enjoyed the read. Any possibility that you guys will start to sell a replacement HDTC/HDMI card? I had a “stupid” accident while upgrading wi/fi card and broke the HDMI connector on the HDMI card (please don’t ask, I am totally bummed about it). 3dr support gave me a contact for a company in Chula Vista the may offer a replacement but have not heard back from them. Thanks! I’m very interested in interfacing the i.MX6 with the Pixhawk 2.1 board. I own a 3DR Solo, belong to a AMA club with access to some great airfields. I also have the ok to fly out of our towns Boat Ramp area. I’ve been having a great time creating my missions in Tower.. now I’m experimenting with the Alfa antenna for increased range. I would really like to equip my fixed wing r/c with Sololink/Pixhawk. I’ve read the schematics.. looked at the published code on Github. It looks possible. Are there wiring diagrams posted for interfacing the i.MX6 with the PIXHawk 2.1 for FPV ? Hello Jordi. Wondering about any news lately. Your blog has been silent for awhile now, and with the exception of a new GPS, not much has chamged in your Store. Thx for all your work in the community over the years.